I often work with usability in online development projects, but I very often also notice counter-productive hardware design wherever I go. I can’t help wondering what the hardware designers were thinking of and if they ever tested it on humans before release? I then tried to fill my water bottle under this tap, for my upcoming spinning class. I started to look for how to turn the water on. My first try was to wave my hand under the water nozzle, since it looked like one of those taps that starts automatically when you put your hands under the nozzle. So I thought: Maybe this little lever on the side is not for lifting the sink plug as it looks like, maybe it controls the water flow? But nothing happened when I turned the lever. So then I figured there could only be one route left, to press the red ring on the top with my finger. But it was lukewarm, and I wanted cold water from my bottle, (in Stockholm we drink the tap water you know). So how could I regulate the temperature? Well, now I was getting impatient and a bit irritated, my spinning class was about to start. So I peeked around the tap and found that there was indeed blue and red marker arrows on that little lever on the side, the one I thought was for controlling the sink plug (since that is the way a majority of sink plug levers look around the world) but since the markers are very small and turned 90 degrees to the side it is very hard to detect them. So I thought this was rather stupid interface design, but perhaps there was a hi-tech finesse in that red light on top, it perhaps turns blue when the water is cold? So I turned the lever in the direction of the blue arrow, and indeed, the water turned cold, but the light stayed red. 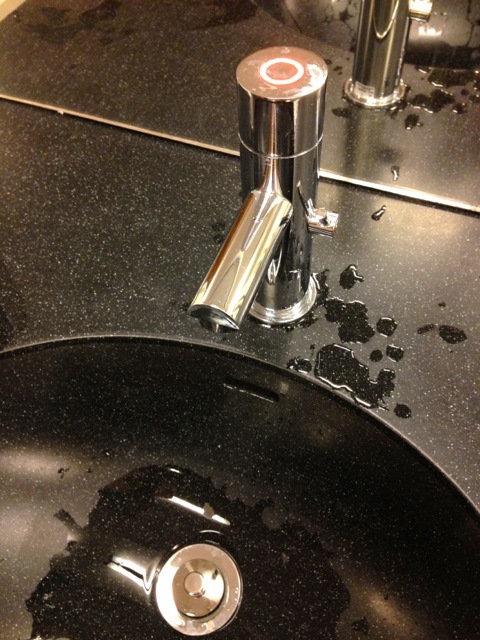 And as soon as I held my water bottle under the nozzle, the water stopped coming. Turns out the tap is timer-regulated to save water, and I had spent 90% of the time looking for the water temperature control. So I again pressed the red lights on the top and finally managed to fill my water bottle with cold water. All this only took me a minute, but it should not be necessary. When I got back from my spinning class the dressing room was full of men, so I started to observe how they handled the new taps. Not a single person was able to get the water out of them without either experimenting like me, or asking others how it worked. These taps are beautiful and probably quite expensive as they are electric and have those red LEDs on top. I wonder if the manufacturer ever tested it on real users? Anyway, a very simple device like a water tap should not require instructions, they should be intuitive to operate.